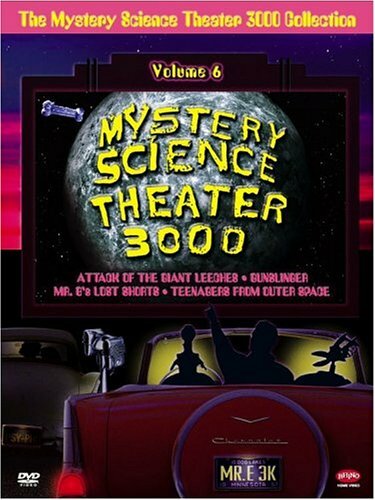 Mystery Science Theater 3000 (Collection #6) - BUY THIS DVD! The sixth installment of this popular TV show that took as its premise an evil experiment taking place on another planet, orchestrated by mad scientists. Their subjects, Joel and Mike, were forced to watch an endless stream of bad movies, during which they made wisecracks and comments throughout. This volume includes GUNSLINGER, MR. B'S NATURAL SHORTS, ATTACK OF THE GIANT LEECHES, and TEENAGERS FROM OUTER SPACE. THEN SEND IN YOUR NAME AND ADDRESS TO contests@efilmcritic.com. Put "WATCH OUT FOR SNAKES" in the subject line and cross your fingers. We will draw names and one of the DVD packages will be yours. Only 1 entry per household.